indigo foundation and our supporters run some great events throughout the year – from gala dinners to trivia nights to bike ride challenges. Come along and meet up with our fantastic fantastic community of supporters in Australia. If you are interested in hosting an event we would love to hear from you – info@indigofoundation.org. Click here to read about some of our previous events, like our annual Canberra, Melbourne and Sydney dinners, a private screening of Charlie’s Country with a Q&A by award-winning director Rolf de Heer and an open garden day. We hope to see you at an upcoming event below! 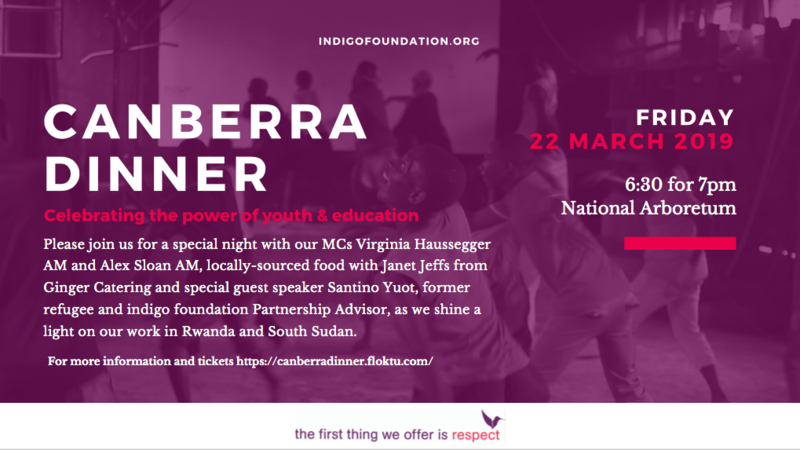 Please join us for a special night of fun and friendship as the sun sets over Canberra. It’s guaranteed to be a great night with double-act MCs Virginia Haussegger AM and Alex Sloan AM, wonderful locally-source food with Janet Jeffs of Ginger Catering and special guest speaker Santino Yuot, former refugee and indigo foundation Partnership Advisor fresh from working with the community in South Sudan. This year we are celebrating the important work our community partners are doing to empower young people, improve education outcomes and unleash the power of youth leadership. We will shine a spotlight on our partnerships in Rwanda (including a special video from the Club Rafiki dancers who use hip hop to promote sexual and reproductive health) and South Sudan, where we are currently training a cohort of 60 teachers. Please join us for a very special evening as we celebrate 15 years of working with the Borjegai and Jirghai communities to rebuild education opportunities in Afghanistan. Our guest speaker will Ali Reza Yunespour. Ali Reza is a former Hazara refugee and the current Partnership Coordinator for Afghan schools program. For 15 years we have worked with representatives from the refugee community in Australia to rebuild schools, train teachers and improve education in the Borjegai and Jirghai regions in Afghanistan. Despite the ongoing conflict in Afghanistan, this unique partnership has made incredible gains – more students are completing school and getting into university and more girls are able to enter the classroom and unleash their potential. Who: MC’d by the wonderful Verity Firth. Verity is a former NSW MP and Minister for Women and Education and is now the Executive Director of Social Justice at UTS. With Verity in charge, it’s guaranteed to be a great evening. Are you keen to take on a riding challenge, make friends and raise funds for indigo foundation at the same time? Our good friends at the Billberry Bluestocking Fund are organising the 4th annual bike ride for women’s empowerment in March 2019 and you can join them – either as a rider or by backing them and making a donation. 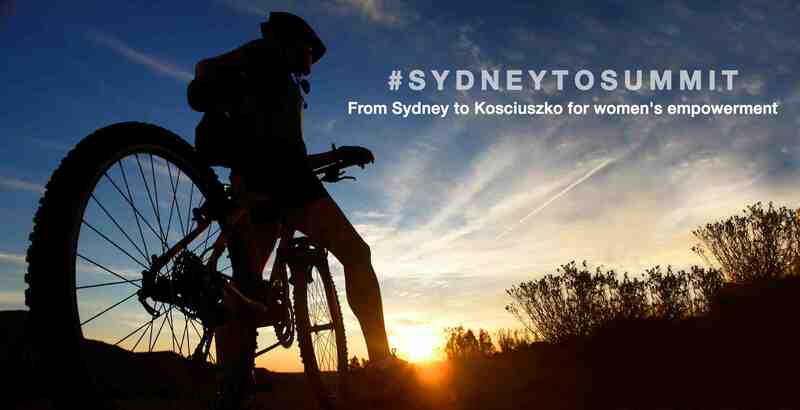 In 2019, the ride will go from sea level in Nowra via Canberra to the summit of Mt Kosciuszko. You’ll be joining an inclusive and lovely bunch of riders getting fit and creating change. To find out more, visit here or contact info@indigofoundation.org.